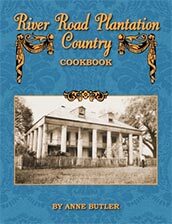 A cookbook that is focused on the historic, mighty, rich and diverse area in Louisiana...an area focused on the Mississippi River and the plantations that lined it...can you imagine? I am a big history buff...especially when it focus on the culture and traditions of a people or an area...and extra especially when it circles around and connects to the food and eating habits of those people! From the swanky river boats to the owners of the manor homes and slaves that worked their plantations to the generous cook at a Leper's colony under the guise of an ostrich farm...Anne Butler weaves history, photographs and recipes from this connected, yet diverse area that she adores. She operates a bed and breakfast on the Butler Greenwood Plantation which dates back all the way to the 1790's (how badly do I want to visit there!?). Butler used tons of photos, all in sepia, to help draw me in and set the tone of a history book...and included recipes...from each of the separate areas of this Plantation Country that she described. Some dated way back and some were current. Either way you look at it, I was happy that I had my little sticky tabs handy...it was then just a matter of choosing which of the marked recipes I wanted to try right away! The section on Community Coffee Company was one of my favorites...dating back to a General Merchandise company that started in 1919 that ground and brewed coffee on the spot and served as a meeting place for local friends and neighbors. By 1924, the backyard barn had been transformed into a coffee mill...and by 1946 the company had its own roasting plant. The Community Coffee Company is a landmark and a huge part of the community and the whole South these days. I love coffee in any form anyway...and the recipes included from the CCC all had me drooling...but the Coffee Pecan Pie was something I had to make! And I was NOT disappointed....except by the fact that the hubs devoured almost the whole pie by himself. Shhhh....don't tell him I told you. Although I didn't actually use CC coffee since I don't have any (Sure, I could have ordered it, but I didn't want to wait)...the rich, deep, earthy flavor of the pie paired with a nice cup of coffee and a blob of whipped cream was like being lost in a dream. Apparently I was in a pie kinda mood while reading this, because I made not one, but another pie from the book. I've always wondered about Buttermilk pie...and there was a recipe for it in all of its splendor...so I couldn't resist. This recipe was from The Cabin...a restaurant/bar/lounge...that had its beginnings as slave quarters on the Monroe Plantation almost two centuries ago. I don't know if it was me or the recipe (although I'm guessing it must be me because if they serve this at the restaurant, it must work for them), but I couldn't get the pie to set up! Oh yeah, it looked all golden and gorgeous and crispy on the surface...but inside was another story. Oh well...I broke off the top layer of cinnamon/sugar goodness and ate it like a biscuit, so it wasn't a total bust. From an old Indian camp in disrepair came a Leprosarium under the guise of an Ostrich Farm. 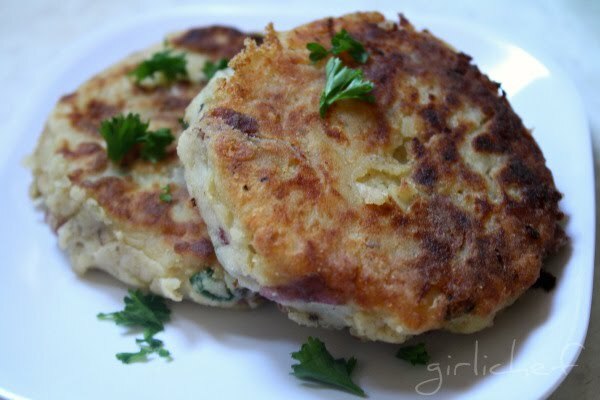 What an insanely interesting piece of history lies behind a simple, tasty recipe for Cajun Potato Cakes! The last thing I made from the book was definitely my favorite. From grandmother of a local art and history buff at Sun Oak in Faubourg Marigny is a delicious Cabbage Roll...called fondly Grandma's Cabbage Cigars. Sauté ground meat, onion, bell pepper and garlic until meat is cooked. Add breadcrumbs to hold mixture together. Season with sugar, green onion tops parsley and salt and peppers to taste. Cover cabbage leaves in boiling water, cook for 4 minutes and drain. 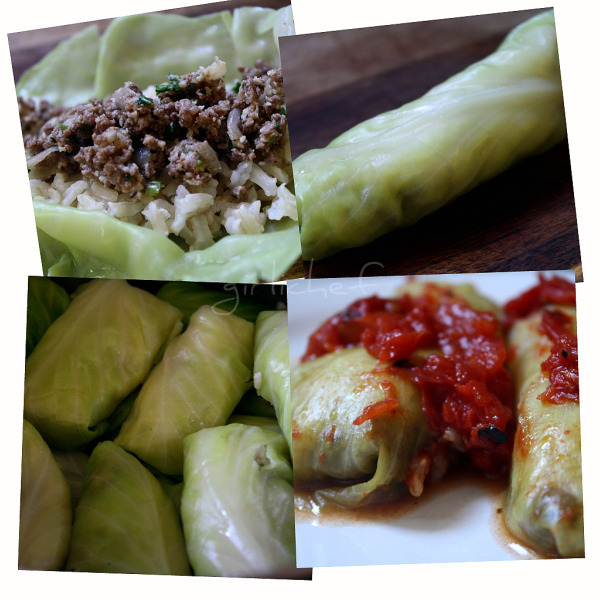 Place portions of rice and meat mixture in each cabbage leaf and roll. Place rolls in a deep pot seams down. Add canned tomatoes, cover and cook over medium heat for 20-30 minutes. Serves 4-6. Know what I love about this recipe other than its delicious outcome? The impreciseness of it. It is like so many of the recipes that my own grandma has. No amounts, just ingredients for parts. It urges you to use your senses. Choose your favorite type of ground meat. Season it to your family's tastes. Feel it...smell it...eyeball it...taste it. Gorgeous. I am looking forward to going back (ha! looking forward to going back) and checking out Butler's previous three books which are all written in the same style...history, culture, food and photos. 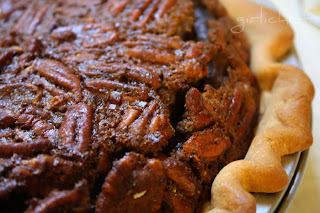 I have always wanted to make pecan pie but strangely I never got around to make one. Weird! I like that potato and especially the cabbage wrap - looks so yummy. They have a cabbage wrapped with meat stuffing in France. My mom in law made it before - it was so good. I have to ask her to teach me how to make it. I made a buttermilk pie from Stirring the Pot and had the same trouble getting it to set up too. I'm not sure, but I'm wondering if it is suppose to be served that way?? It would be interesting to find out. Great review... My favorite kind of cookbook, filled with local history. And who wouldn't want to make something called grandma's cigars! This does sound like an awsome cookbook. I enjoy reading cookbooks like this and the recipes sound good too. I make stuffed cabage very similar to this! I loved melding food with history. It immediately draws me in. 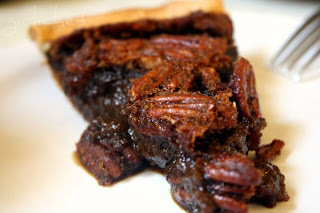 The idea of a coffee pecan pie warms me. And I am going to love saying, "We're having Grandma's cigars for dinner." It just rolls off the tongue! Lovely review. Cool review. I want some that pecan pie all of the sudden. This book is calling to me!!! Speaking directly to my southern roots! its telling me to go down yonder to the corner book shop and pick me up a copy. Sounds like a wonderful cookbook and very nostalgic...i grew up on all of this good food! I love free cookbooks but I believe I'd part with some coin for this book. Nice review! Ooh that pie! I bookmarked a coffee toffee pecan pie a couple weeks ago and have been dreaming of it ever since! Sounds like a good read. I have a very old River Roads cookbook from the Jr. League of NOLA that I love. We lived in Vicksburg, Mississippi and enjoyed all of the old antebelum homes there. Several friends owned some of them and we were frequent visitors. They really live the part of the "old south" with it's traditions and ways. 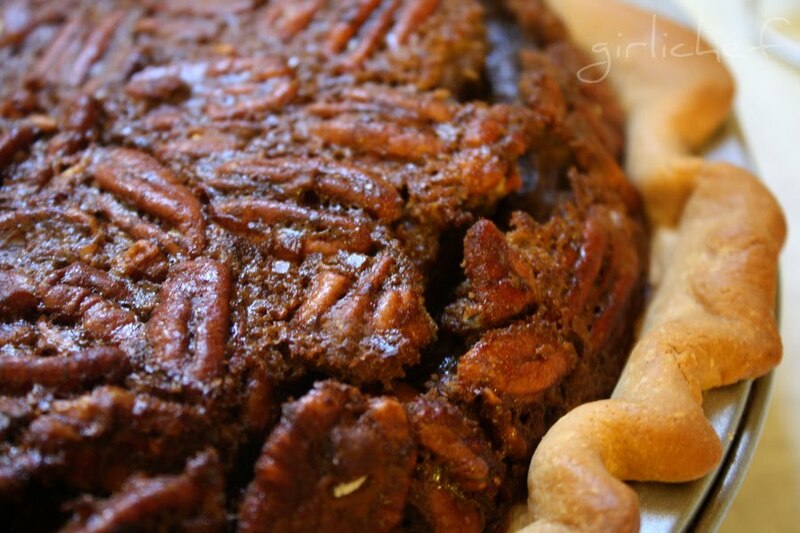 The pecan pie is probably the symbol of the south. Thanks for the great review of RR Plantation Country Cookbook. 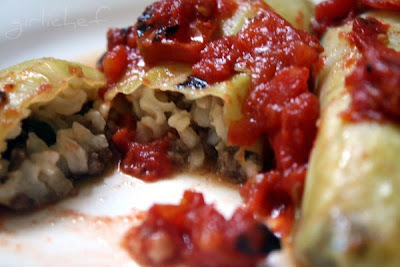 I miss cabbage rolls! Need to find that recipe on your site.